If one wants to go ahead in the boardroom, believe it or not the colour of your suit can make a difference to the way you are perceived. Hard work and quality of your work play the most important part in your success but don’t underestimate the looking the part and how it can influence your success. 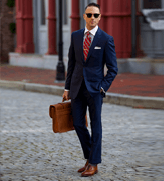 A power suit is a Business Suit that makes you feel successful, confident and in control. Here are some suit colour options for your power suit, make sure at least one of the following colours is part of your suiting repertoire. Navy blue suit has to be on the top of the power suit list. Navy blue is the universal colour for power dressing. It is versatile and highly fashionable. Navy Blue suit exude authoritative behavior, security and confidence. The younger boys who would like to be taken seriously should opt for a charcoal power suit. Charcoal colour has an ability to give the wearer appearance of maturity. Other advantage of wearing a charcoal suit is that you can match it with lot of different colour options in particular pastel shades. If you want to give the vibe of man in control and looking to exude authority than black is the colour for your power suit. The only disadvantage with black is that it is a little less versatile when compared to the other 2 colours grey and navy. Apart from looking good a power suit must make you feel confident and comfortable that is why a tailored business suit is a must. Perfect fit and impeccable tailoring helps you project confidence. 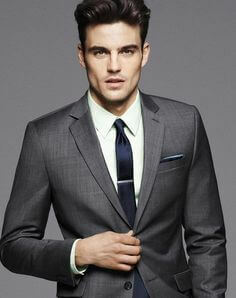 Book an obligation free appointment with Bentex suits in Sydney CBD for men’s tailored suits and shirts now!